Fig. 3 The length of the smallest EcoRI fragment associated with the disease in unrelated FSHD individuals. 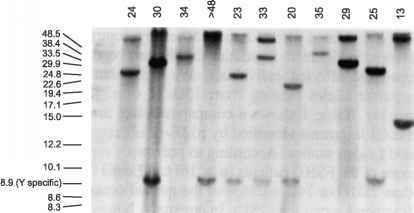 Ten micrograms of DNA was digested with EcoRI, fractionated on a 0.5% agarose gel for 48 hr at 0.5 V/cm, and Southern-blotted onto HybondN (Amersham). The DNA on the membrane was hybridized with radiolabeled DNA probe p13E-11. Lane 1 contains high-molecular-weight markers. Lanes 2-12 contain DNA samples from unrelated FSHD patients. The corresponding smallest EcoRI fragment size is written on the top of each lane. The 8.9-kb fragment represents a Y-specific sequence. age of disease onset is invariably later in female FSHD gene carriers, who are also more likely to exhibit a less severe form of the disease. 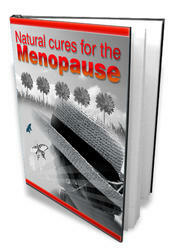 It has been suggested that female hormonal status somehow confers a mild protective effect. Consistent with this view, disease progression is markedly accelerated in female patients following menopause, which is often associated with a general decline in muscle strength.